Lucky Winner of Pensive Thoughts’ Rashfree Giveaway! Pensive Thoughts’ Rashfree Giveaway garnered a total of 63 entries. There were only 40 qualified entries for this giveaway, however. 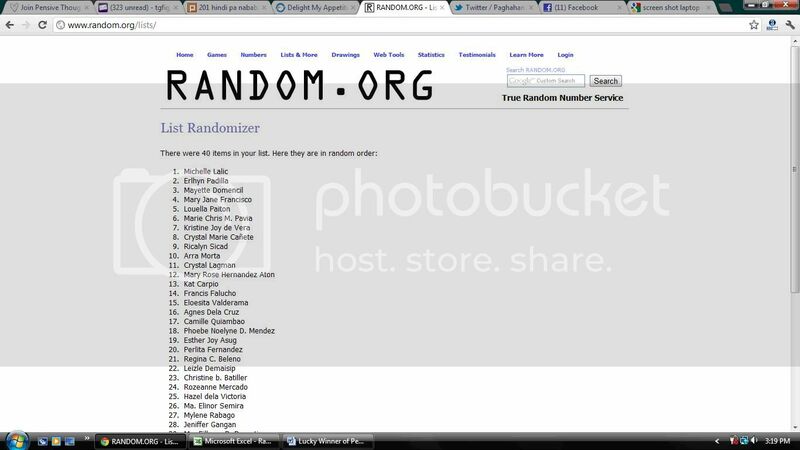 And the winner is…MICHELLE LALIC! Congratulations! Michelle, if you’re reading this announcement, please email me the following details: your full name, complete shipping address and contact number. Unilab will take care of shipping your prize. Thank you to everyone who joined, and thank you Unilab for sponsoring this giveway for Pensive Thoughts! This entry was posted in Rashfree Giveaway, UNILAB. Bookmark the permalink. One Response to Lucky Winner of Pensive Thoughts’ Rashfree Giveaway!